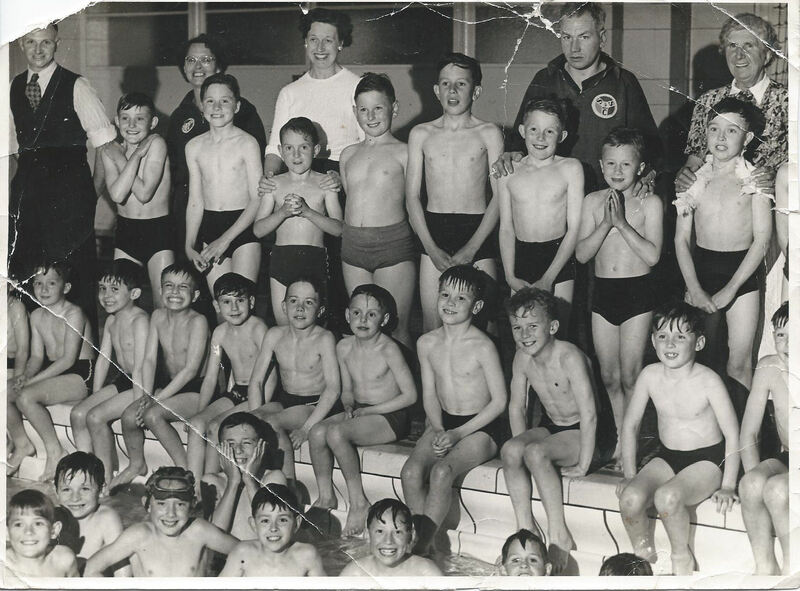 This is a photo of some of the members of The Shiverers Swimming Club in the mid-fifties at The King Alfred Swimming Baths. The club was well named as the water was absolutely freezing. The gentleman at the back 2nd from the right with the club badge showing, used to take us for life saving lessons, but his name escapes me. I am sitting on the poolside fourth whole person from the right. to my right is Geoff Atkins, and in the water 2nd from the left is Pete Thursby. We all lived in Mile Oak Road Portslade but I haven’t seen either of them for fifty years! Do you recognise yourself or anyone else here? If you do please leave a comment below. Shiverers Swimming Club Members in the Mid 1950s at The King Alfred Baths Hove. Oh I remember that pool so well, just the sight of the ‘overflow’ brings it all back. So many great days spent in there in the 1960s! Easily reccogonise the life guard at the back, 2nd from the right, he had put on a tad of weight by the 60s. I think he must have worked there for many years, and will be well remembered by many of my age group – “let’s do a bomb when he turns his back”! First thing that struck me when I looked at that photograph, was how healthy all those kids looked. A bit before my time, I was a “Shiverer” 1961-3, and my brother before me, can’t see him though. I was in the “rosebuds” and we swam against other towns & clubs for the Shiverers. It was sort of a club within a club for the best swimmers. Still got a plaque I won and still swimming – although a bit slower now! I was in the Shiverers for several years in the 1960s from the age of about 8 to maybe 15 – all that training, all those galas, and all those wonderful volunteer coaches most of whose names I now can’t remember, though I do remember Mr Franklin and his sons Chris and Timmy. The badge I sewed on my tracksuit was just the same as the one the coach in this picture is wearing. Ah, the Shiverers. Great times – both me and my sister (Kim) swam there from 1965-1971. My dad was a timekeeper in the galas, and my mum used to teach the little ones to swim. Yes, I too remember Mr Franklin and his sons (they had a newsagents, I believe, near Sackville Road). Also, George Ely used to train us. We used to have inter-club galas at regular intervals, with exciting coach rides to Southwark, Southwall and Bognor. Plus – for those in the teams, there was a weight-training room under the pool – complete with record player! The woman in the white top at the rear has her hands on the shoulders of Keith Alexander, I believe. There was a white haired older man who taught swimming there, Mr. Woodman? The boy in bottom left corner could be Euan Tomkinson. I was also taught to swim here. Remember the Cork training boards. I used to go fishing with Pete Thursby around the Henfield area, late 1950s. His Dad ran a pub in Worthing near the Station. They lived at 181 Mile Oak Rd. I think the above photo is around 1951-53 and not the mid 1950s as the faces I know would be about 8 or 9 years of age then. What memories! I too was a member mid 1950s and went on to have both our children in a swim club and now grandchildren! Got my love for the water in Brighton & Hove though and swam in the sea there often. We since lived in Africa and are in Canada now. I’ve never forgotten the Shiverers’ name! We lived in Fairfield Gardens, Portslade and attended St Nicholas School until 1956 if anyone else did the same at that time? There were two lads that I worked with in the early sixties that were Shiverers, Jimmy Funnel and the other fellow’s surname was Churchill. For Lisa Tomkinson: Lisa, I knew your dad, Euan, from a very early age. I used to live at 21 Benfield Crescent while he lived at No.5? I saw the June 1953 coronation at his house as we didn’t get a telly until that August. We both went to Benfield School and the Portslade Boys at the top of Applesham Way. The last I heard was that he died in Hong Kong in 2000(2) but you say later. I often talk to his brother Richard. My email is: chris@mcbrien410.plus.com I’d love a chat. I have seen this photo many times. When you look at the kids you can see why they called it the Shiverers Swimming Club, most of the kids look as though they were freezing. Just as I was all those years ago at the Black Rock swimming pool, it was better to stay in the water to keep warm. Good days. I was a Shiverer between 1940 to 1946. I still have my badge! I was a Shiverer probably late 1950s-early 1960s. Seem to remember the Reeve family as coaches, think there was mum, dad and a daughter. Does anyone recall that name? I managed to attain ‘one star’ status in the award scheme at that time. Think you had to swim several widths of the ‘major’ pool at the time. It all looks familiar. I remember names like John Murray, Brian Beal, Dudley Siefert, Tom Green, Jasper Stevens, Elizabeth Hadrill, Jannet Thompson, Avril Maude, David West etc. My father used to coach along with Cryril Gilbey and the Ely bros.
Ha, I remember you Ron. Did you live in Locks Hill? We also went to school together (St Nicholas Infants). I remember you got a nose bleed and I got the blame. I really enjoyed the shiverers. I think I managed three or four stars, breast stroke my thing. I remember Ron Reeves. He had the best technique for butterfly and freestyle I have ever seen to this day. I remember he went to Aussie in the early 70s, came back for a while and played a bit of local water polo and never saw him again. His Dad Ron Senior was a swim coach at Brighton Swim Club.